The financial chess game in Europe is still being played out, but in the end it is going to boil down to one very fundamental decision. Is Germany going to allow the ECB to print up trillions of euros and use those euros to buy up the sovereign debt of troubled eurozone members such as Spain and Italy or not? Nothing short of this is going to solve the problems in Europe. You can forget the ESM and the EFSF. Anyone that thinks they are going to solve the problems in Europe is someone that would also take a water pistol to fight a raging wildfire. No, the only thing that is going to keep Spain and Italy from collapsing under the weight of a mountain of debt is a financial nuke. The ECB needs to have the power to print up trillions of euros and use that money to buy up massive amounts of sovereign debt in order to guarantee that Spain and Italy will be able to borrow lots more money at very low interest rates. In fact, this is probably what European Central Bank President Mario Draghi has in mind when he says that he is going to “do whatever it takes to preserve the euro”. However, there is one giant problem. The ECB is not going to be able to do this unless Germany allows them to. 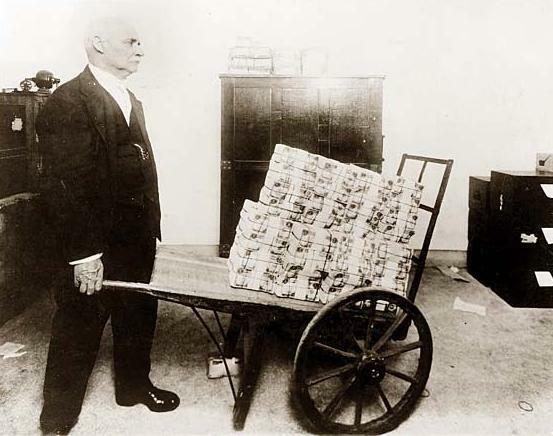 And after enduring the horror of hyperinflation under the Weimar Republic, Germany is not too keen on introducing trillions upon trillions of new euros into the European economy. If Germany allows the ECB to go down this path, Germany will end up experiencing tremendous inflation and the only benefit for Germany will be that the eurozone was kept together. That doesn’t sound like a very good deal for Germany. Well, if you still don’t think that the problems in Europe are going to affect the United States, just check this news itemfrom the Guardian….